To notify the Attendance Office that your child will be late or absent, please call (818) 790-3333. Call 818-949-5514 for admissions information, or email admissions@flintridgeprep.org. Share news and get back in touch by contacting the Co-Director of Alumni Relations at alumni@flintridgeprep.org or look around the Alumni Pages. Flintridge Prep has two parking lots with assigned parking for faculty and students. The upper lot is located at the corner of Foothill Boulevard and Crown Avenue. The lower lot is located on the corner of Foothill Boulevard and Hampton Road. These parking lots are available after school hours for all visitors. If you're here for an interview or a tour, you can park anywhere along Crown Avenue and enter the campus through the administration building. 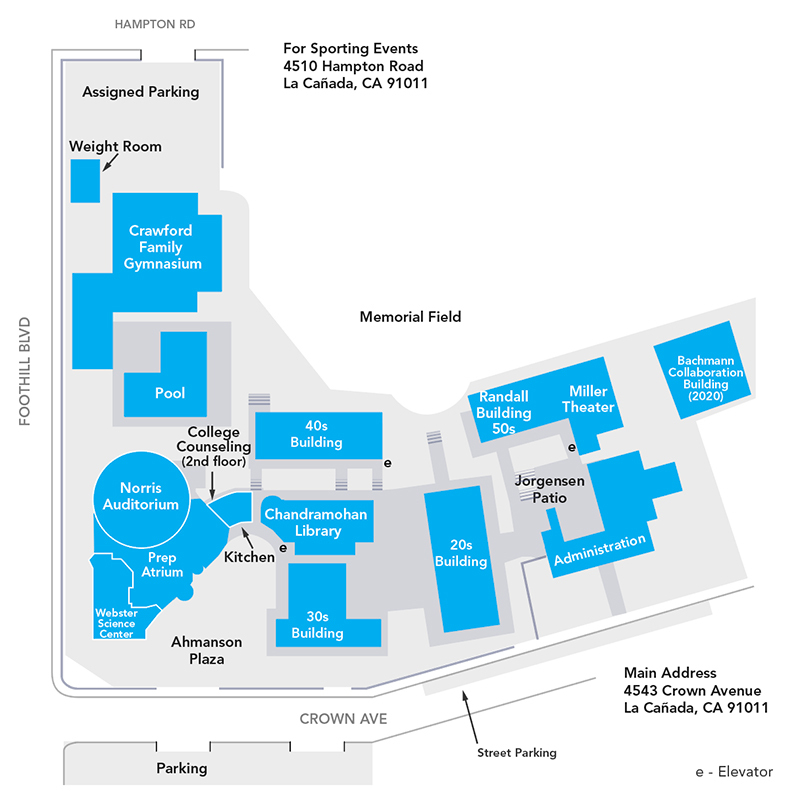 Visitors for athletics events or events in Miller Theater can enter the campus from the lower parking lot on Hampton Road. Please do not park in front of our neighbors' homes. Press requests can be directed to communications@flintridgeprep.org. Vendors who are using the school logo or creating apparel click here for logos and guidelines. Contact Nicole Trevor, Director of Communications (ntrevor@flintridgeprep.org) for more information on logos, designs, and guidelines for use. College representatives are to park on Crown Avenue near the administration building; we ask that you not park in front of residences in order to respect our neighbors. Please enter campus through the main office located on Crown Avenue, north of the parking lot on your left hand side. Upon entering the main office, you will be greeted our receptionist and a Junior Ambassador will walk you to the college counseling office.